South Korea, however, is having none of that. 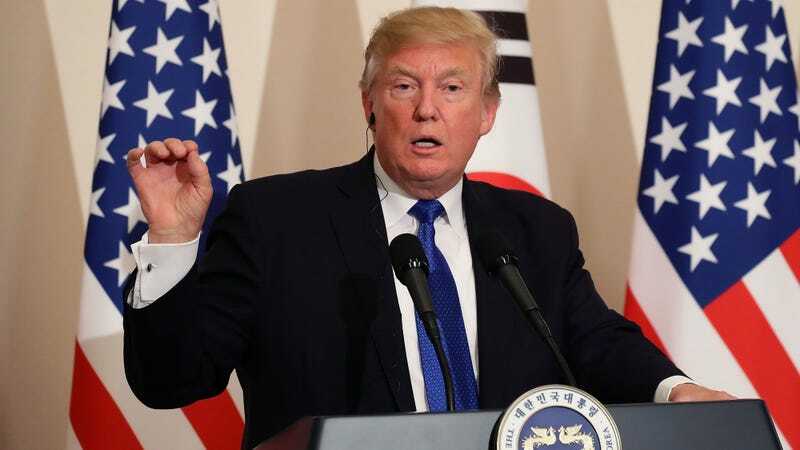 As reported by AFP News, tonight Trump will be the guest of honor at a state banquet in Seoul, where he will be feted with gourmet Korean dishes prepared in the restaurant of South Korean presidential residence the Blue House. The centerpiece of the meal is beef ribs (so far, so good) prepared with a gravy made from an “exquisite, 360-year-old soy sauce” (uh oh). The menu was specifically tailored to appeal to Trump’s toddler-esque palate, officials tell local media, with an unnamed official describing the meal as “food that has local, traditional flavor that could also appeal to the taste of the US head of state.” So as long as no one tells Trump the soy sauce is older than the United States itself, we should be good. However, the meal also includes a prawn with the head still on, which could very well result in a low-level aide sprinting to the nearest McDonald’s.